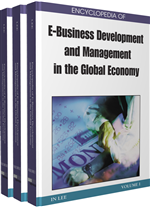 As B2B e-business shifted to the Internet, Electronic Marketplaces (EMs) have grown rapidly in usage (Rask & Kragh, 2004). Definitions of an EM are diverse. One of the earliest and broadest definitions is offered by Bakos (1991), who referred to an EM as “an inter-organizational system that allows the participating buyers and sellers to exchange information about price and product offerings”. In the context of logistics, EMs can be termed Electronic Logistics Marketplaces (ELMs), referring to an electronic hub using web-based systems that link shippers and carriers together for the purpose of collaboration and/or trading (Wang, Potter, & Naim, 2007a). ELM is a context specific type of EM, which facilitates the provision of logistics services. Traditional forms of communication between a shipper and a carrier are rather fragmented when a shipper has a number of carriers to manage. Such one-to-one exchanges can be costly and sometimes very time-consuming. Communicating through an ELM allows the connection of a number of shippers and carriers using a single interface, normally a Web-based system. This has brought advantages to organizations in terms of low cost inter-organization information connectivity, (near) real time visibility, and flexible partnership configurations. A basic ELM is normally composed of three key parties: shipper, carrier and technology provider with the primary objective of efficient and effective delivery. In some circumstances customers (the recipients of the products) get involved as well. Emerged since the late 1990s, two main types of ELM came into practice: open and closed. The former is mainly for trading purposes and the latter is used to facilitate long-term collaboration between shipper and carrier. It should be noted that there is not a binary distinction between open and closed ELM, there is possibly a spectrum with differing degrees of openness and closure. Early ELMs were open systems, such as www.teleroute.com, and are mainly price driven. They tend to be a neutral marketspace and focus on matching the supply and demand of transport and logistics services between shippers and carriers. A typical example is an online freight exchange for the spot trading of transport services. Despite the benefits of lower search and coordination costs from using open ELMs, there is an increasing need for companies, and particularly shippers, to retain their linkages with preferred business partners (Dai & Kauffman, 2002). Carriers, in particular hauliers, are often reluctant to join an open ELM, as they fear being judged purely on carriage rates and not on total service delivery. A trend was observed that “early days of freight exchanges must now put less emphasis on open-market exchanges and more on their ability to work with closed communities of users who trade with each other” (Lewis, 2002; Rowlands, 2003). This has resulted in the recent development of closed ELMs. A closed system is developed towards the needs of particular shippers and/or carriers. Membership is only available to those who are invited to collaborate. Contracts often already exist between the shipper and carrier. Customers are usually long-term and actively involved in the logistics process. To date, most of the closed ELMs are initiated and led by the users of logistics service providers, i.e. shipper(s) or logistics brokers like a 4PL company. While open ELMs are already well established, closed ELMs have emerged recently and hence are still at their infancy stage. But this novel form is seen to bring greater benefits to the organizations than the open ones. Hence the closed ELM is the focus of this article. EM: Electronic marketplace, an online marketplace where buyers and sellers meet to exchange goods, services, money, or information. PAYG: Pay-as-you-go, a software pricing model sometimes also known as ‘on-demand or Software as a Service (SaaS). Unlike traditional applications that are paid for with an up-front license fee and installed on a company’s own premises, on-demand systems are hosted by the vendor and typically paid for on a subscription basis. ELM: Electronic logistics marketplace, an online marketplace where shippers and carriers meet for either spot trading of transport services or for long-term collaboration. Shared ELM: an ELM usually hosted by an independent technology provider and within which individual sub-ELMs can be created for individual shippers’ use. If they want to, shippers or carriers can work across these individual sub-ELM systems too. 4PL: Fourth party logistics, a term coined by global consulting firm Accenture, “an integrator that assembles the resources, capabilities, and technology of its own organization and other organizations” (for example, carriers) to provide comprehensive supply chain solutions. B2B: Business to business, an e-commerce model in which all of the participants are businesses or other organizations. EDI: Electronic data interchange, the electronic transfer of specially formatted standard business documents such as bills, orders and confirmations, sent between business partners. Private ELM: an ELM created and maintained by a dominant supply chain player purely for its own management of its carriers. Collaborative ELM: an ELM created by a consortium of industrial companies aiming to pursue network optimization across companies, which may be hosted by an independent technology provider.